Universal HUGE 100 sq. 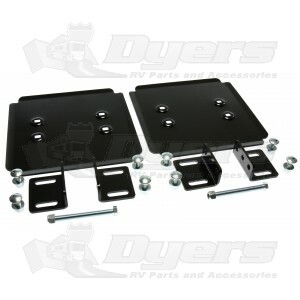 inch fit foot pads are perfect for any trailer jack leg. Works on all types of manual and electric jacks. Extra Large 10 in square steel pads offers firm support in soft ground. Heavy duty, thick gauge steel with superior rust-inhibitive finish. Low Profile can mount permanently on jack. No need to remove for storage.